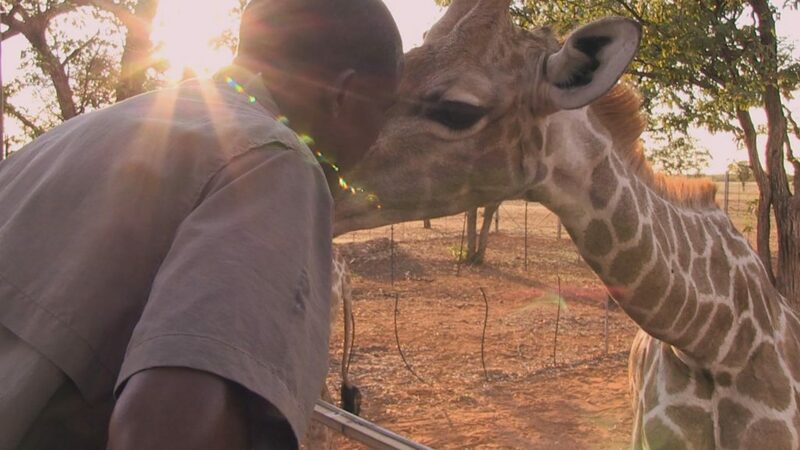 Max Kapembe kissing a giraffe. Max has a great relationship with animals. He is an animal minder at Okutala Lodge. Namibia, a country in Southwest Africa, is distinguished by the Namib Desert along the Atlantic Ocean coast. The country is a haven for diverse wildlife with a significant cheetah population. It is one of the countries in the world where wildlife roams freely. Okutala Lodge boasts of a large number of wild animals. Here, tourists from all over the world get the opportunity to come closer to nature. Among its employees, is Max Kapembe. Wild animals in Namibia. 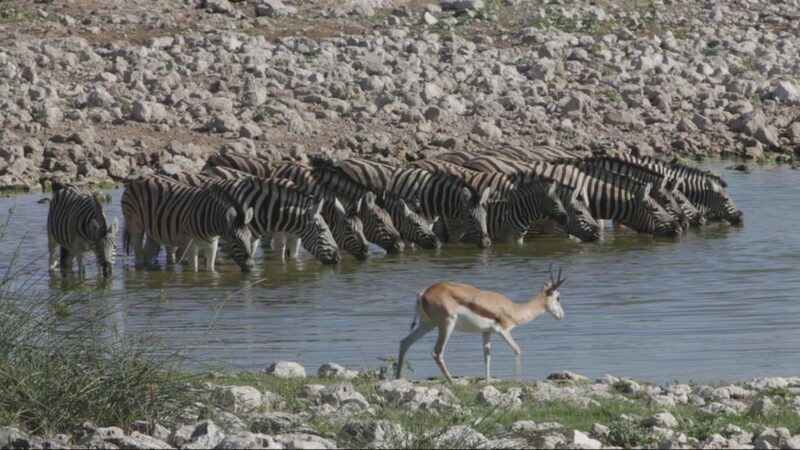 Namibia is the only country in the world where wild animals roam freely. Max has been working at the Lodge for ten years. Originally a laborer, he discovered he has an unusual way with the animals and he is now an animal minder. Max has an incredible relationship with the many of the wild animals at Okutala Lodge. “At first, the work I did at the lodge was maintenance, fixing fences with the farm workers and also gardening. The manager started thinking about my shift to animal work,” recalled Max. Today, Max’s daily tasks include taming, watering and feeding the animals that are kept within closures, and also checking that all the fences remain intact. He does not fear most of the wild animals except for leopards and lions. His nature of not fearing the animals started when he was asked to open the gate for the guests to view the cheetahs and he recounts his experience. “It was my first time seeing the wild animals up close. So I stood there thinking, there’s nowhere to hide when the cheetahs come near. And I stood there looking at the fence and thought I would jump it as soon as they come! The moment I opened the door, they rushed towards me. I wanted to run but part of me said, if you run, they will catch you from behind. 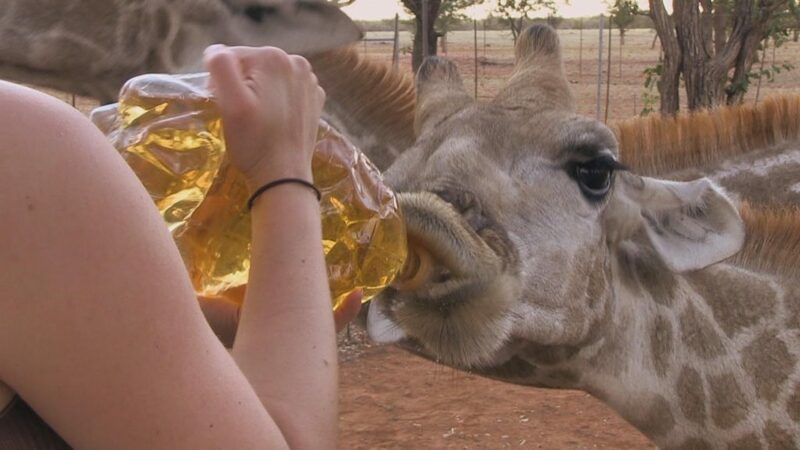 Tourists at Okutala Lodge giving giraffes tea. So I accepted it and they ran in a curve past me towards the meat. I stood there shaking! From there I calmed down and did not feel fear again,” he recalled. When guests visit the lodge, Max and his colleagues take them to have an encounter with the animals. If it’s the giraffes, the guests have an opportunity to feed them black tea which they like a lot. Max has number of tactics that he uses to get close to the animals. “You must speak with the animals. If you do that, they also understand you. If you call him and he does not understand you, speak softly. Then he will come to you. If you don’t speak to animals, they will never pay you any attention. When you get to the birds you must speak or whistle or sing. They will recognize your singing and realize, Max is here,” explained Max. His best animal relationship is with a hyena called Wolfie. He has taken care of Wolfie since he was brought to the Lodge when he was young. “Wolfie was brought here by plane after he was sedated,” Max recalled. From the start, Wolfie and Max made an immediate connection. “I took a piece of meat and gave it to him by hand. He took it out of my hand. A few days later, I went in alone and gave him meat and saw he is fine with me. I thought, well, it seems I can also work with hyenas! And I thought I will keep this one close to my heart – he will be my child,” he told. Max has taught Wolfie many things including bathing. He feels it would be very difficult to part with Wolfie. “I will not know how to feel the day Wolfie leaves or when he dies. I will probably become ill if that happens. I would not know how to go know with life…” told Max. But Max is not as close to his family as he is close to the animals. His wife works in Swakopmund, six hours drive from Okutala. Hence Max and his daughter don’t get to see her often. His desire is that one day he will become a tour guide in the lodge and that way he can be able to earn well and live together with his family.